TJ'S Catering offers restaurant quality food and service for all you're catering needs. Our kitchen is open six days a week. We are happy to customize menus to suit any dietary concerns you may have. We are happy to provide full service catering for you if you require it, china, linen, and staff for your next VIP meal. TJ's Catering has the solution for all of your business catering needs. Our Corporate Breakfasts include everything from A la Carte menu selections to a number of complete hot or cold breakfast presentations. TJ’S offers a selection of Sandwich box lunches as well as Salad options, with many creative platters to choose from. Take a look: We are confident that there is a menu item that you will enjoy. V.I.P Hot Buffets are designed for those who do not have the facilities to heat food. There are over 35 different entrees. Choose from our pasta, chicken, pork, beef or our personal touch buffet menu lists. 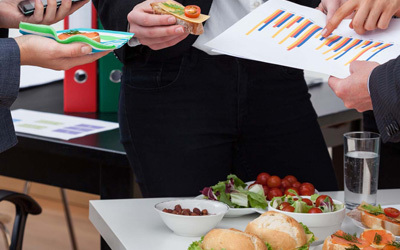 Budget Luncheons are designed for those who are tired of Sandwiches or Pizza, to help keep your budget balanced. Our luncheons are just the right portion and variety and priced just right. Healthy Choice Menu We created a menu that has the good carbohydrates that is 50 or below the glycemic index combined with our quality proteins. You will be left with a meal that will boost your metabolism, not put you to sleep. Take a look at our selections we are sure you will be pleased. Assorted Hors D' Oeuvres A wide variety of Hors D' Oeuvres for your office happy hour or next company reception. was founded in Southwest Houston in 1978. 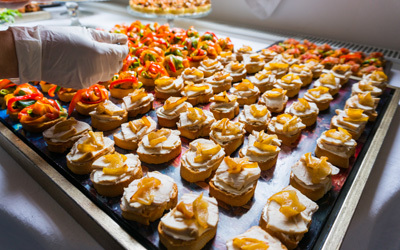 TJ's is a family-owned and operated catering establishment with over 16 years of food service experience and a life-long passion for great food. Our chefs have trained with world class chefs in Chicago, New York, San Francisco and Switzerland. Creating a wedding reception that reflects your tastes and preferences! Bringing restaurant quality food and service to special event catering. From basic to elaborate, your satisfaction is guaranteed!